I'm pulling together a small set of short observations about free and open source software and business mechanics. Many of these ideas came together in the essay to be published shortly by O'Reilly, and were presented in the USENIX 2005 invited talk. 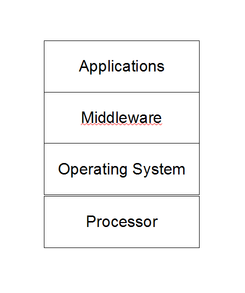 One of the things that continues to bother me is everyone keeps talking about "the stack" model, as in "open source is eating it's way up the stack." I think this view is too limiting and prevents people from seeing real opportunities (and threats). It's not a stack — it's a network. This is the "classic" sort of drawing we've all come to see. And people talk about open source eating its way up the stack because they all look at Linux in the operating system layer and the onrush of JBoss and MySQL in the middleware layer, and so forth. This is where we start to see it's not very "stack" shaped anymore. With not too much imagination you could start adding new nodes and edges and the "network" begins to get quite complex quite quickly. You could further expand nodes with soft services like training, consulting, support, and indirect products like fabrication and design tools. So why is this a better model than a simple stack? First, it better reflects the reality in a connected market and allows people to realize the stack they see may not be the same stack their customers, partners and competitors see. (They may have a different ordering of what's important to them.) In Christensen's second book he coined the Law of Conservation of Attractive Profits (which is since renamed the Law of Conservation of Integration). His research bears out a model that when the incumbent in a market space over delivers, so begins delivering functionality faster than their customers can or will adopt it, there is generally a call for standardization, and the component players can now make money, and profitability begins to move to adjacent nodes in the network. 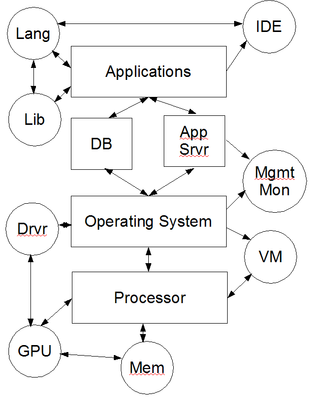 Moving to a network model and getting away from simple statements like "open source is eating it's way up the stack" and the disconnected observations of "open source is a services or hardware play" allows us to see a richer picture of opportunities. And if you're the incumbent, you can better see the threats. Unfortunately, there's prior art. Or maybe this is where trademark law and patent law collide?!?! Maybe we need the Supreme Court to decide who and what is right. Actually, this is where Microsoft's head of intellectual property strategy needs to spank the lawyers for wasting his budget and review the internal process as to when they get called. Really. How much shareholder money was spent on this application and to what end? "Move along. It's just an accident. Nothing to see here folks. Move along." I came across this editorial fear mongering about software property management by the CEO of Palamida. He tries to relate it to the Grokster case (and gets it wrong). Programmers are using open source components. (He refers to both your own ignorant overworked drones working at midnight then plays the xenophobia/tribalism card and suggests those pesky offshore consultants might be doing you in as well). He never once mentions that his company sells a nifty tool that scans software for matches against open source projects. A wander through the Palamida web site and a read of the white paper demonstrates it suffers the same problems as other tools in this space. The tools all claim to scan your source against a library of open source signatures, as if open source is somehow the cause of this problem. The assumption is that developers must be stripping copyright notices or directly plagiarizing code fragments (otherwise a file tree walk with grep would find the relevant copyrights.) The second assumption is that you must be in violation of the license. The real problem however is that such tools (and I'm assuming they perform well and are robust) can't find the problem with all the other third party code sources that could show up in your source code (text books, portals like MSDN and the O'Reilly Network, third party library code from Oracle, RogueWave, etc.). These third party corporate backed sources are more likely to litigate than a free or open source software project that wants you to comply with the license, and the scanning tools won't find those problems. I wrote about open source risk management in the enterprise earlier when it came to SCO.